Larvae – Slender, white and worm-like. 3/8 inch long approx. 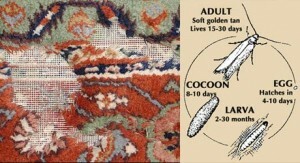 If you can spot these wriggling around in your rug then moths have already settled and laid eggs which have hatched. Cocoons – Look like elongated, fuzzy capsules. 1/2 inch long approx. Can be difficult to spot because of their texture camouflaging them against the wool. Excrement – Grainy, brown, soil-like. 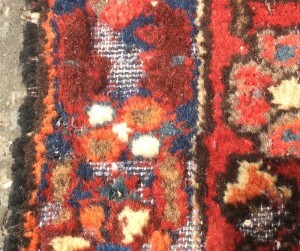 Difficult to differentiate from other soil that could be present in the pile of the rug. Loose Fibres – A big giveaway that there may be moths living in your rug. 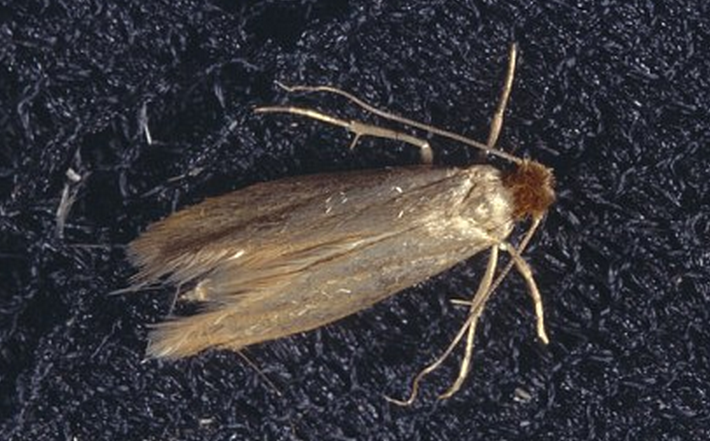 Flying Adult Moths – The common clothing moth (Tineola bisselliella) is a soft golden tan/silvery brown colour. Fly slowly but beat their wings fast. 3/8 inch long approx. Moths search for and feed on the protein Keratin which is found in natural animal based fibres such as wool and silk. They feed on it during the larvae stage of their life cycle. They digest the keratin and use it to cocoon themselves. They cannot digest cellulosic fibres such as cotton or hemp which is why you will often find that a moth eaten rug will be left with the foundation intact. The adult moth will emerge from its cocoon and begin laying eggs which hatch into larvae, thus starting the cycle of rug destruction all over again. Moths naturally require a dark and undisturbed area to carry out all this activity and so they will always favour parts of a rug which are concealed, perhaps under furniture or curtains, to inhabit. Dirty rugs are particularly at risk because household dust contains dead human skin which also contains keratin. We seal and segregate all moth infested rugs brought into our facility prior to giving them a thorough immersion wash. We apply a specialist moth treatment during the wash and to allow it to penetrate the fibres and then also spray the product on both sides once it is dry. We do not just spray a generic permethrin based treatment once the rug is dry as is common in our industry. Our moth treatment works as a repellant by making the rug taste undesirable to moths thereby forcing them to look elsewhere for keratin. This is an extremely effective way to protect rugs containing wool, silk, goat and camel hair. Let in Light – Moths favour dark areas, so keep curtains and blinds open in unused rooms. Vacuum Regularly – Incorporating a regular and effective rug vacuuming approach into your cleaning schedule will disturb the life cycle of any offending moths. It will also serve to remove dead skin cells; a desirable food source for moths. Don’t Position Rugs Under Furniture – Unless you’re willing to move the furniture every time you vacuum this will only serve to give moths a dark and undisturbed hiding place. Store Safely – If you need to store rugs for an extended period of time it is advisable to have them professionally cleaned, protected with a moth treatment, and wrapped in either Tyvek® or craft paper. This will ensure that they are moth free going into storage and will remain that way. Learn how to store your rugs safely at home. Inspect Regularly – Get into the habit of looking at your rug closely and with purpose, on both sides, in order to spot any signs of moth early and prevent the need for a costly rug repair.